Cardiff Blues survived an onslaught from Pau's powerful pack to book a place in the European Challenge Cup final. 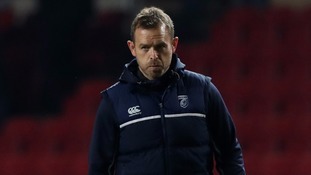 Wasps have confirmed that Cardiff Blues head coach Danny Wilson will join their coaching coaching team for 2018/19 season. Matthew Morgan grabbed two tries as Cardiff hit back from an 11-point half-time deficit to clinch a 43-29 victory over the Dragons. Wales flanker Sam Warburton's knee injury will not interfere with his Lions chances, according to Blues boss Danny Wilson. Cardiff Blues lock George Earle has failed to get an eight-week suspension for eye gouging overturned. The 30 year old was sent off during the Blues' 38-3 European Challenge Cup loss against Bath last month for making contact with the eye area of flanker Tom Ellis. He pleaded not guilty to the charge, but was given a two-month ban. Earle appealed the ruling, but an independent committee rejected the bid. He will not be eligible to play until February 13th. Scarlets held on to their first half lead to beat Cardiff Blues at Parc y Scarlets. Scott Williams carried the ball over to increase the Scarlets' lead, with Rhys Patchell securing the conversion. Willis Halaholo brought the Blues back into the game with a try and Steve Shingler closed the gap to five points again. Aled Thomas had a couple of chances to put the Scarlets further ahead, but could not capitalise on them. Final score: Scarlets 15-10 Blues. Scarlets welcome Cardiff Blues to Parc y Scarlets in the first derby of New Year's Day. Steffan Evans put the hosts ahead just after 10 minutes crossing the line with a try. Rhys Patchell added to the lead with a penalty against his former club, but Steve Shingler closed the gap to five points for the Blues shortly after. Half time score: Scarlets 8-3 Blues. Scarlets have confirmed outside half Steven Shingler will leave Parc y Scarlets at the end of the season to join Cardiff Blues. Shingler has made 63 appearances for the Scarlets, to date, in four season scoring 322 points. A knee injury in the victory over Edinburgh at the Parc will keep Shingler sidelined with an end of season return likely. Firstly, I’d like to thank Scarlets for their support over the last few seasons. I’m very much looking forward to making a return from injury before the end of the season and helping the Scarlets in the final push for silverware. The Cardiff Blues have beaten Ulster 23 - 13 in the Pro 12. The Blues were behind for most of the match but tries from Rhys Patchell and Aled Summerhill helped give the home side the win. Captain Ken Owens scored the only try of a scrappy match to help Scarlets register a crucial Guinness Pro12 derby victory over Cardiff Blues at Parc y Scarlets. 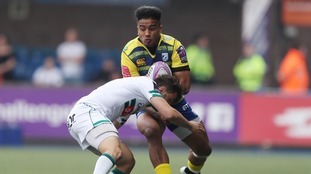 The win lifted the west Wales region into sixth place in the league to boost their chances of claiming the final automatic qualification spot for the European Champions' Cup. It now goes down to final match of the regular season at the weekend when Scarlets travel to Treviso, while Connacht in seventh, four points behind, will host leaders Ospreys. Owens' try came in the second half after an error-strewn match had been neatly poised at 9-6. Scarlets were indebted to 11 points from the boot of Rhys Priestland, while Blues' points came by way of two penalties from Rhys Patchell. Scarlets were at near full-strength although they were without Regan King with concussion. This was Priestland's final home game before he joins Bath in the summer. The west Wales region were unchanged from the team that beat the Dragons 29-17 on Judgement Day.